People that enoy cooking (and even those that don't) sometimes find themselves at a loss for what to cook. Maybe they've run through all of their go-to recipes or maybe they just have no idea of what to whip up. Another problem might be that they have an idea for what they want to cook, but need to find a way to accomodate certain dietary needs. And finally, it can be diffiult to scale ingredients up or down when the number of servings is more or less than what the recipe was written for. Recipe Bot solves all of these problems. Recipe Bot listens for direct messages (DMs) in Slack. 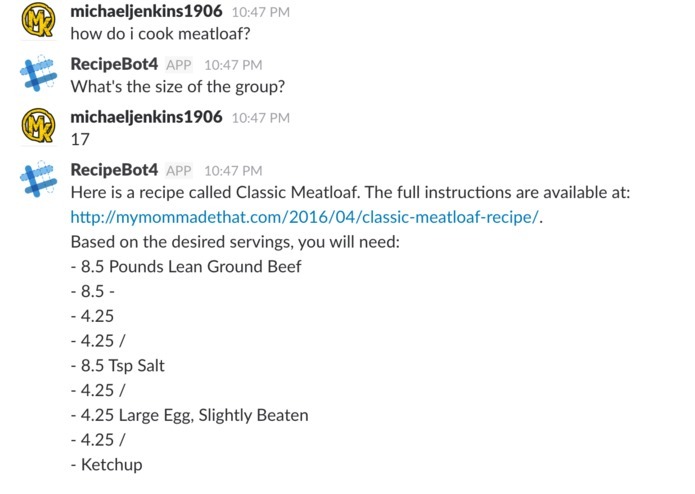 A Slack user starts a conversation with Recipe Bot by telling it the main item. Recipe Bot prompts the user for the number of servings needed and then replies with a link to a top-rated recipe along with ingridents scaled to the correct amounts for the requested serving. Our team approached the problem in three ways. We started with the Lex implementation. For this phase, we developed the correct utterances and repsonses until we had a working prototype that could capture requests and prepare a query for Yummly, a recipe search engine. Next, we developed a python script deployed in Lambda that captured the query from Lex and made an API call to Yummly. With the reply from Yummly, the script parsed the recipe for serving sizes and ingredient amounts. Given the serving size need for the query, the script scaled the ingridents accordingly for the response. The response was then returned with the name of the recipe, the ingredients, and a link to the recipe. Finally, we used the Slack API to deploy an application that could receive the requests; parse the request through Lex; submit the query to Yummly via Lambda; and then reply with the recipe and specifics on the ingredients. 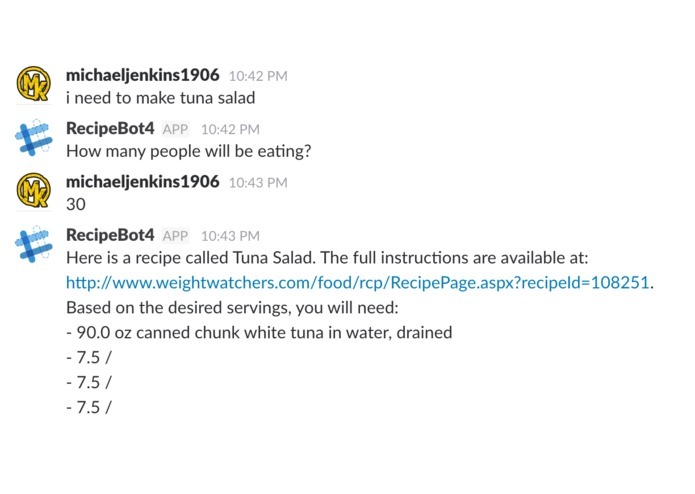 The main challenge we ran into was getting Recipe Bot deployed to Slack. While implementing a bot in Lex was fairly easy, getting the connection between Slack and Lex proved troublesome. Specifically, we had problems getting the bot to respond to all team members via Direct Message. Initial deployments had Recipe Bot only responding to the team member that did the deployment. 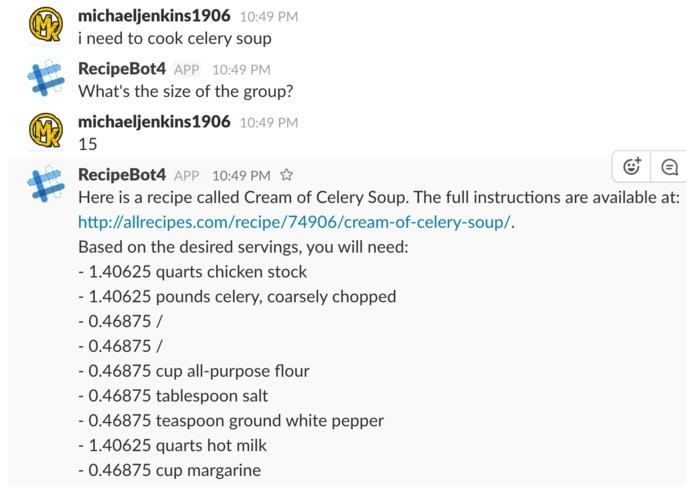 We experimented with deploying the bot to the 'general' channel but then anything that was entered in the channel was interpretted by the bot as a request for a recipe. Finally, we were able to work through the deployment issues and found a solution that allowed for all team members to correctly DM Recipe Bot and recieve proper responses. We found another challenge in parsing the resposes from Yummly. To begin with, making calls to the Yummly API were unintuitive in the order that parameters needed to be passed. 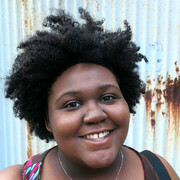 The responses would also come back in unspecified orders. And finally, we encountered problems parsing ingredients that included fractional measurements like "1/2 cups". Measurements that were given as strings ("a dash of salt", for example) also proved difficult to parse when amounts needed to be scaled up or down. We are proud that we came together as a team to learn more about using Lex as a service for parsing conversational input; using Lambda for making triggered calls to remote APIs; and using Slack as a medium for interacting with bots. Getting the bot successfully deployed to Slack was a great accomplishment for the team. After having bots that weren't very conversational, it was great getting a complete response once everything was correctly in place. We learned alot about breaking up duties in the team so we could work on different parts of the project in parallel. We also learned that some APIs might seem easy to interface with but may require substantial testing and debugging to really learn how to use them in spite of what is given as documentation. We already have ideas for improving recipe bot. First we'll take care of the major bugs in this minimum viable product. That includes any quirks in the responses from the bot and getting fractional ingredients properly parsed. We may also take the time to explore a different API for searching recipes, looking for one that is a bit easier to interface with. Also, based on the pricing, we will look to switch over to another API that will better fit our needs. In any case, the team will continue to learn more about programing and deploying software that includes natural language processing. Start a direct messag with the bot and tell it what you would like to cook! I worked on integrating the Yummly API into our bot. Specifically, I wrote the functionality that allows us to search Yummly, a recipe database, grab a matching recipe, and get the details of the recipe, including the name, ingredient list, and the recipe URL. I also worked on functionality to parse the ingredient list and scale the ingredients based on the number of desired servings. I learned a great deal about using Python to interact with APIs as well as other software engineering tasks within the Python ecosystem, such as logging, testing, and mocks. I worked on setting up the infrastructure for the team including git repos, a Slack channel, a Yummly account, and an AWS account for building the bot. I worked on a POC bot to get a handle on creating an AWS Lex bot and integrating it with Slack. I wrote the project description, made the demo video, took screenshots, and prepared the final submission. 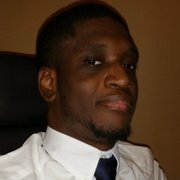 I worked on the backend to implement the logic for handling intents from the Lex bot in Python. I also worked on the Lex console to setup the slots and utterances for the bot, and helped setup the Slack integration. I learned a great deal about integrating Lex with AWS Lambda, and deploying services with CloudFormation.